Lakeview is no longer just an entertainment district. It’s now a place where people live, and that’s changing the options available — for the better, in our view. Developments like 29 Seven and Iron City Lofts are offering new residential space, but transitioning from an entertainment destination to a complete neighborhood means offering more than novelty options. There has to be substance there, too, for it to attract a sustained resident crowd. 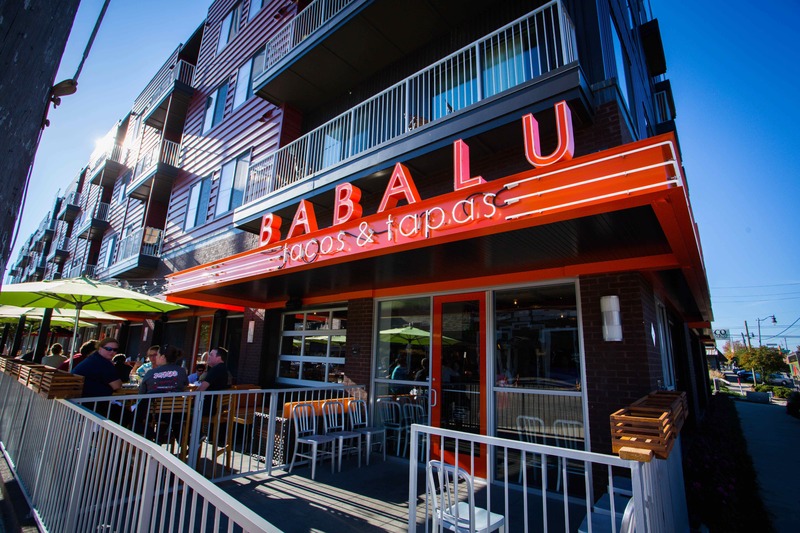 With Babalu Tacos and Tapas, Lakeview has managed both the flash of an entertainment district and the depth of a neighborhood restaurant. We have to admit: We’re often suspicious of the tapas-style approach. Too often, small plates turn into large checks as you cobble together a meal from teasingly dainty portions. Happily, the small plates at Lakeview’s Babalu tend to pack a satisfying punch. At the very least, you’ll feel that you had a complete meal, which is the genius behind assertive taco plates and wonderfully layered tapas. As dedicated tasters who insist on sampling around the table, this relatively affordable small plate concept works well for us. If you’re not into sharing, rest assured there are still options built for one, including generous meat-topped chopped salads and the Baba burger. It’s best to have a consistent table strategy, though, so plates arrive in proper sequence. No matter what, you’ll want to start with tableside guacamole. It’s fresh and delicious and not too much of a spectacle. Plus, you’ll need the time to strategize your order. Go ahead and choose your drink, which may take some time. There’s a long cocktail list, but Babalu is also a good bet if you fancy experimenting with the wide world of sipping tequilas. Consider saving room for dessert as well, since the sampler option offers the taste of multiple sweets we always crave. Whatever combo you choose, we’d suggest including the dulce de leche cheesecake. The bottom line is that Babalu is punchy and fun. It feels new and young without having too specific a crowd. It’s thematic but not overblown, which fits well with surrounding Lakeview entertainment. Where, say, the Loft District or South Avondale tend toward a polished industrial style, Lakeview is a little more all over the map. It’s where role-playing mystery games happily coexist with barbeque from an old house on a hill, sports bar trivia, and late night dancing. Like its neighborhood, Babalu is full of a quirky but appealing energy. It’s the kind of place you could easily be a regular, especially if you lived upstairs.